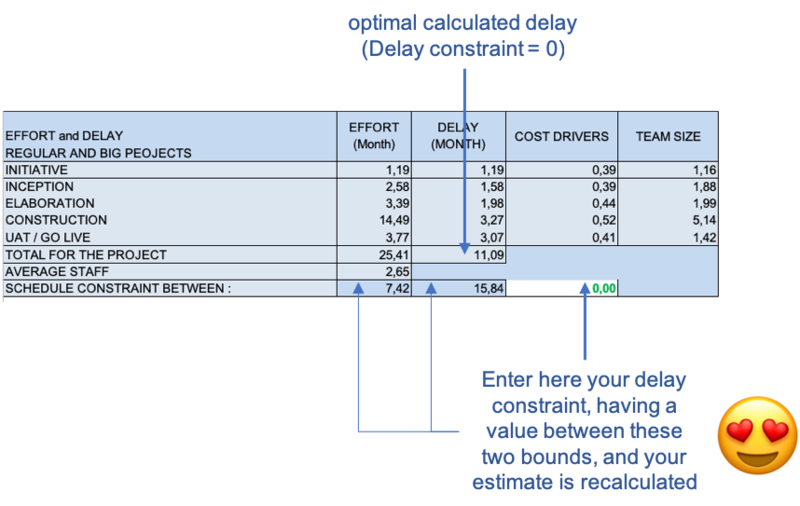 This article proposes a tool and user manual that updates the estimation models proposed by Barry Boehm (Constructive Cost Model or COCOMO) in 1981 and Alan Albrecht (Function Points) in 1979. I know it does not make us look younger, but these mathematical models keep their interest in estimating software projects, Agile or not. Having had the opportunity to work on a tool commissioned by Computer Associates at MIT in 1991, which implemented these two techniques, I took a close interest in these models, as well as the link that could be made between them. Function points and CoCoMo. 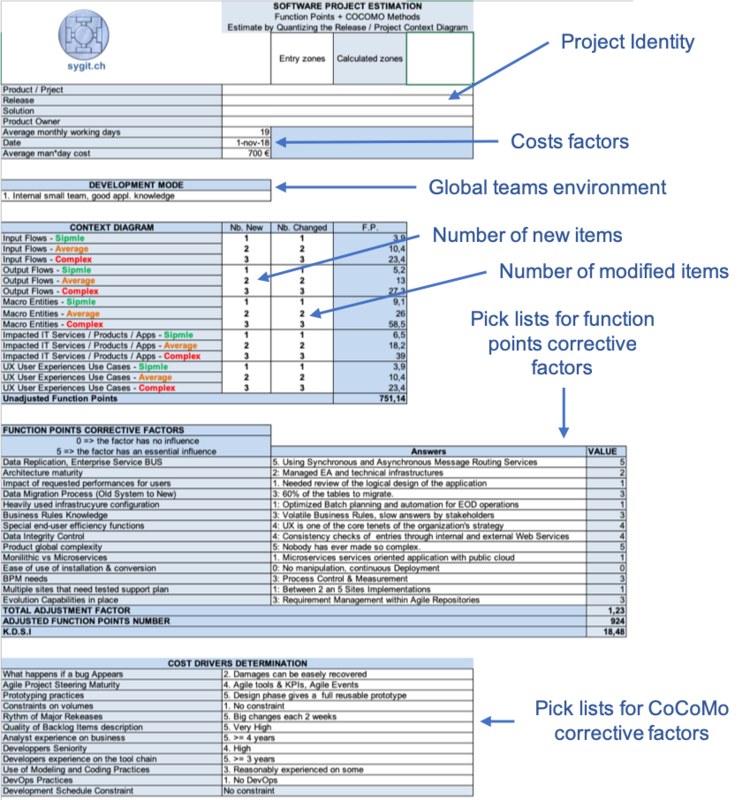 The Computer Associates tool already offered higher-level quantitative criteria than those used by the function points and CoCoMo, criteria found in the project / product context diagram at the end of the Project / Release inception phase. 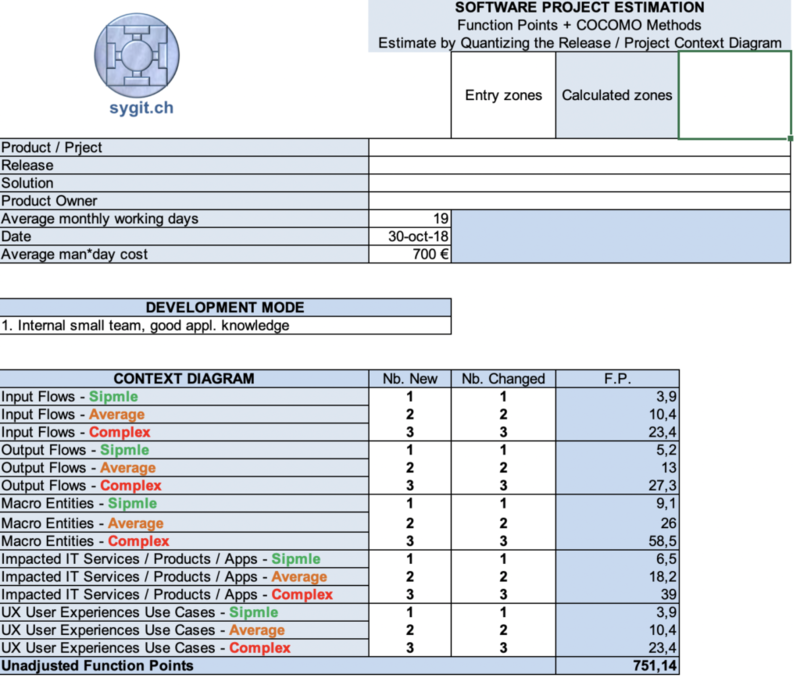 After a first version on Multiplan, I quickly adapted my first tool to Excel, and made it evolve with the new tools and methods of development, while testing it on many projects of respectable size. The strengths of Barry Boehm’s formulas: They take into account the effects of scale, and make it possible to calculate the size of the teams according to the constraints of delay which are imposed on you (between the two limits which are indicated to you in the tool ): The more people you add, the more coordination you need. Let us now turn to the concepts used, and the granularity of the quantitative elements to be entered. 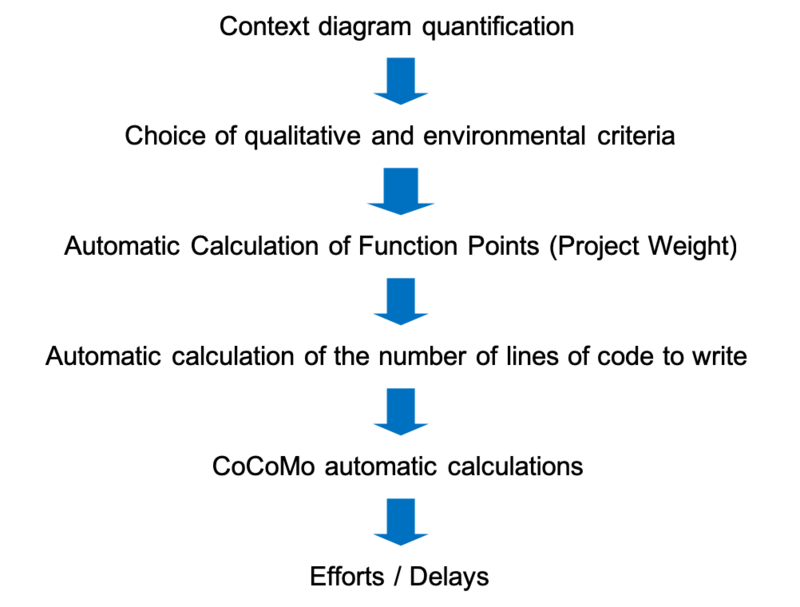 The context diagram is a graphical representation of the relationship between the analyzed application domain and the outside world. This is a level 0 chart used to determine high level interfaces. The detailed analysis phase will use the context diagram as a basis for breaking down features and flows. 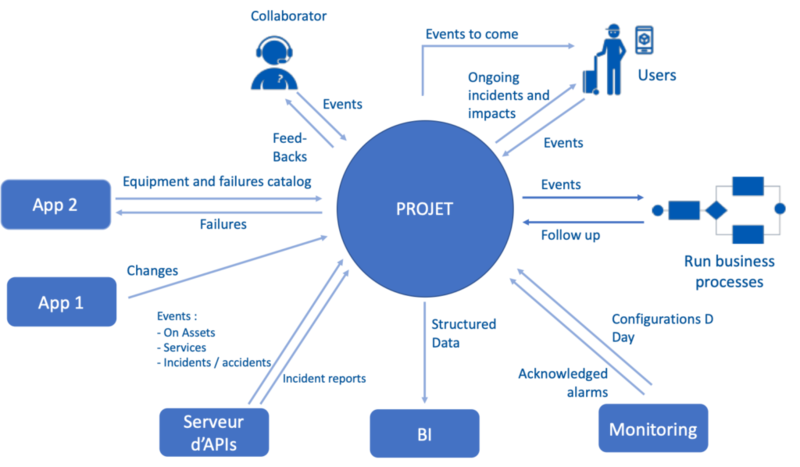 The context diagram is co-built with the business and is a valid representation of the project view from the user. The actors are specified in an exhaustive way. An actor is not part of the project in the sense that one does not model his tasks, but he exchanges information with the applications and products modified by the project / release. We will indicate (in the actor’s description) what are the responsibilities of this persona in relation with the various processes / tasks implemented. 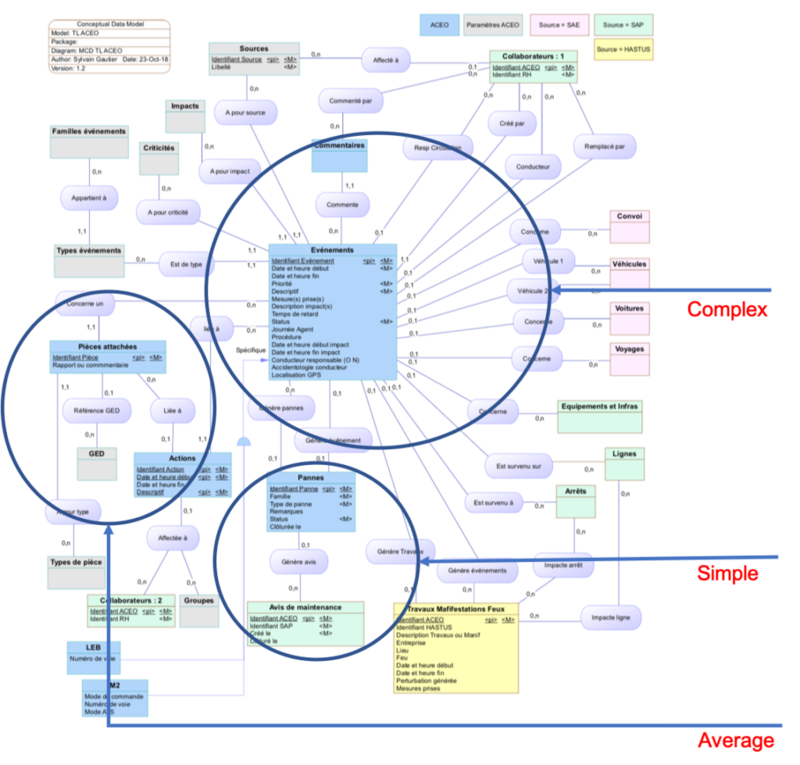 Note: The context diagram of an application accurately reflects its application flow map, in the Archimate modelization (in contrast to its functional mapping and technical mapping). How many input groups, unique and logical, will the system have to deal with? We count the number of main types of information coming from outside that will enter the system. Information from internal databases is therefore excluded from this total. It is necessary to think in terms of main transactions, of necessary communications for the activity of the studied area. An input information unit is considered to be unique when it requires a different processing logic than other information units. The complexity of a flow depends on the size of the data sub-model it carries and the related rules to process that flow. How many documents (paper documents, files, tables, emails for the outside world) will the system generate as output? Take into account only the major flows and not the minor flows that are derived from them. An output information unit is considered unique when it requires a different processing logic than the other information units. The complexity of a flow depends on the size of the sub-model of data that it carries and the related rules to process that flow. Entities are grouped according to their management goals. For example: command = command header + command line. User experience to perform a business transaction. The data model induced / carried by the item has one or two entities with few attributes, and few relationships with other entities. The data model of induced / carried by the item, has 3 to 5 entities each having about 15 attributes and 3 relations towards other entities. The management rules applied to these entities are less trivial, and can pose problems of response time for example. The data model induced / carried by the element, includes many entities, some of which have a large number of attributes. There are a few multiple to multiple relationships and the rules governing the model are complex. The number of function points can also be used to measure indicators for monitoring quality and velocity.